The shift from life on the street to life inside a community with an apartment of your own can be challenging. Transitioning from being surrounded by people at all hours, to living in your own apartment with a door and a lock can feel isolating and lonely. And adjusting to the rules and customs of a structured community, after years of homelessness, may seem overwhelming and stressful. Pairing housing with supportive services is critical to both helping residents adapt to their new lives and ensuring that they remain housed. As we seek to strengthen Los Angeles communities, the California Community Foundation (CCF) has been a leader in the efforts to increase the production of Los Angeles’ long-term affordable housing that surrounds residents with critical services such as job training, case management and health care. This approach, called permanent supportive housing, has proven to be an effective method in the fight to end homelessness. The key to success is offering more than the home itself. 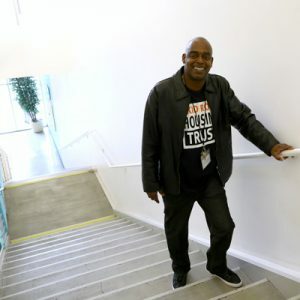 When formerly homeless resident Anthony Haynes moved into the Abbey Apartments, run by CCF partner, Skid Row Housing Trust, he discovered a host of services that helped to improve his quality of life as he settled into his new home. He no longer had to travel across town to the doctor, only to spend hours in a waiting room before being seen – instead, he was able to visit a doctor on site in his building, making him much more likely to seek medical treatment when needed. He also began meeting with a therapist on site – with everyone else around him doing the same, the stigma was removed and he finally felt comfortable taking this step to care for his own mental health. Anthony also joined recovery support groups, participated in community groups such as knitting and attended field trips, which help build community and make connections with other residents. Thanks to the supportive services available, Anthony has thrived in his home at the Abbey, where he has lived for more than eight years. Homelessness is often the result of a combination of many factors. Providing safe, affordable housing is only one piece in the puzzle of solving homelessness. The combination of housing and critical services supports the physical, mental and emotional needs of residents, allowing them to take control of their lives. By increasing the production of permanent supportive housing, CCF seeks to make homes and services available to more Los Angeles residents in need. To learn more about permanent supportive housing and see how you can help people like Anthony overcome homelessness, visit calfund.org/homela.